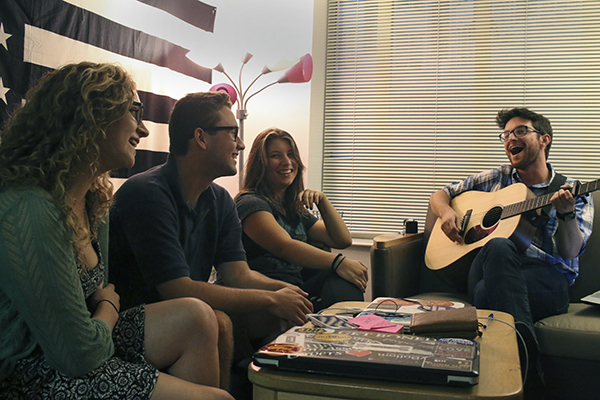 Juniors Jenna Freidberg, far left, Morgan McKee, middle left, and Danielle Baglivo, middle right, listen to sophomore Connor Forsythe, far right, playing guitar after agreeing to sign him to their label Searcher Records. A student-run record label wants to get in tune with GW’s music scene. This year, juniors Morgan McKee and Danielle Baglivo launched Searcher Records, a student-run record label that signed its first artist this past weekend. They hope to help student musicians build up their music portfolios by promoting them, helping them record music and finding gigs where they can play. McKee got the idea after talking to a friend involved with Elon University’s student record label. McKee, the president, brought the idea to Baglivo, the vice president, and the two decided to name the group after one of George Washington’s hunting dogs. With $400 in funding from the Student Association, McKee said Searcher’s executive board is mostly “going out of pocket” to run the label. In addition to musicians, McKee said Searcher is open to students joining the group as scouts who look for musicians at GW. Students won’t be paid as members of the label, unless they are compensated for off-campus performances. In that case, Searcher would get 25 percent of the amount, McKee said. This weekend, the label signed sophomore Connor Forsythe, a singer-songwriter who met Baglivo while the two were working together on Colonial Inauguration over the summer. His first performance with Searcher will be at a Mount Vernon Campus Sunday brunch on Oct. 4. By landing live performances, McKee said Searcher can help student musicians get exposure that they might not get on their own. The group will begin providing talent for Mount Vernon Campus events in October, like Sunday brunches and the Colonials Weekend Vern Harvest, University spokesman Kurtis Hiatt said. “A lot of artists aren’t taken seriously unless they’re signed or unless they have a substantial repertoire of performing under their belt and many artists are, to put it bluntly, too lazy or too scared to do it on their own,” McKee said. McKee said Searcher can also help students get signed to record labels after they graduate. He said the organization already has a connection with D.C.-based record label Proper Vibes, which is run by alumnus Ravi Durga. Durga, who graduated in 2014, met Baglivo through Greek life at GW and began advising Searcher when Baglivo contacted him last spring. He said that Proper Vibes is open to collaborating with Searcher by having their artists work together. Durga added that the key for artists who want to get signed after college is making sure they constantly create music. He said having Searcher on their resume can also help boost their credibility. “It’s definitely good to see that they have someone who’s like, ‘Hey, we believe in this artist enough that we’re willing to help them,’” he said.